Facing the sun, stretch both your arms out to your sides in a gesture of reception, both palms facing forward(this would be the kneeling variant of the Position of the Portal Opener, for those of you familiar with hermetic positions) and proclaim in your mind or aloud “I shall receive gratefully anything good which the universe may send my way today, and call forth the energies of my soul to stir with my own divinity.” Bring your arms back to your sides and lay your hands in your lap, meditating for a few moments and reflecting on your own karma(what good and bad things you’ve done lately that may effect your present day). With time and practice the magician will come to feel a rush of warmth after uttering the aforementioned proclamation, and in this way he shall judge that the universe shall work with him in his operations that day. If after a few months of performing this some parallel feeling is not present, then you should further evaluate your own karma, or examine weaknesses in other parts of your practice. I'm familiar with the Golden Dawn's methodology, though mine is more akin to a synthesis of the catholic cross-blessing, and therein I cross from left to right. None the less, I've made the change appropriately for those familiar with the former method. I'm am very proud of you to post this. I will use this method every single day as a hope to better understand mylife. ok so now that you have the pictures up, not all the pentagrams start at the far left corner? Damn it, Have I been doing it wrong then? Hi. So the basic to a neophite is practice visualization, meditation, study and contemplation. To practice an magick operation: it´s mean that I have to cast a spell -example: elementalist? Why in psi pirokinesis is an advanced skill and here is a beginner practice? In TomeKeeper -sorry I´m reading it but I don´t eat it like a catholic eat a Bible- he say that ritual ara unnecessary. What do you think? The meaning of a ritual itself is of much debate, but it is not the superficial movements, gesticulations, words, or anything else exteriorly occuring which truly matters. What is important is the mindset of the magician during the operation, and the consequent energies that are manipulated by the various symbols, etc, in so far as they have meaning to the magician. But I think that this kind of 'training' has mistake. in this kind of trainig would be wasted on boring routine. then little ritual, always control thoughts etc. etc. and spend it on magick exercise. (or manner ... my poor english. I have a schedule, I write down my goals almost everyday, check to see where I am etc... Managing time and measuring everything out is good, if you can mix it with 'going with the flow' as well. You realize soon enough that you can guide your flow, and it flows that way. Some people try to make a direct line and hit certain targets along the way, but if you mix flowingness together with order and intention you'll flow along and get to where you want to be with the least resisitence. That's how I manage to practice with a busy life, there's always more time you can spend on something you want to do. Yes it is Creature. Thanks a bunch! Here is a link to those rituals outlined by the golden dawn. Again I'm inspired by an article of yours Prophecy. Although I suspect I won't be incorporating this all into my daily practices verbatim, at least not yet, as I am fairly new, there are a few elements I do fully intend to add in, and already have. "If you take what I intend to provide here and make it a daily routine to perform at least most of it then you shall be well on your way in the magical initiation, and I promise you shall begin to see progress in your magical evolution swifter than you had found before by only the sparse practice coupled with some studying." -Beautiful words there, Prophecy, words which I take to heart and act upon. 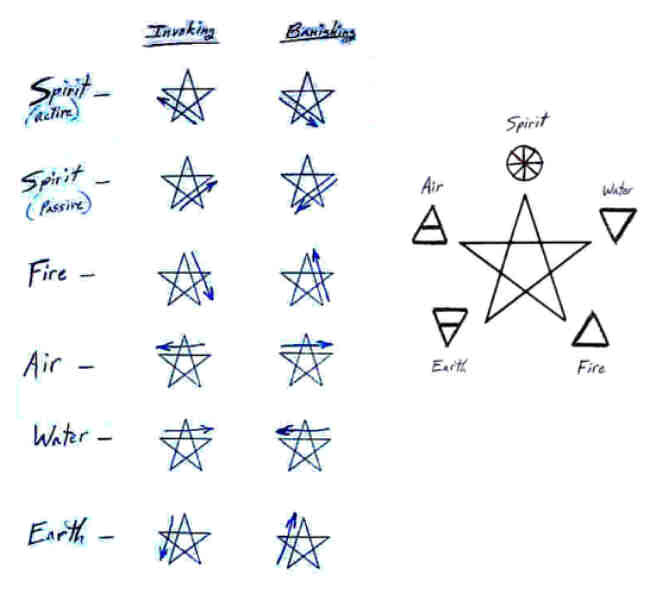 I still can't get the north, south, east, west right on the lesser banishing ritual. But its a great help to see it up on the Veritas site.